In November 2016, Paris Aéroport welcomed 7.1 million passengers, an increase of 6.2% compared to November 2015. 4.8 million passengers travelled through Paris-Charles de Gaulle (+4.5%) and 2.3 million through Paris-Orly (+10.0%). As a reminder, the events that occurred in Paris and St Denis on 13 November 2015 impacted passenger traffic at the Paris airports over the second half of November 2015, resulting in a decrease in traffic of around 6% over that fortnight, compared to the same period in 2014. The number of connecting passengers increased by 1.0%. The connecting rate stood at 25.8%, down by 0.9 points compared to November 2015. Since the beginning of the year, Paris Aéroport passenger traffic has grown by 1.3%, with a total of 89.5 million passengers. The number of connecting passengers has risen by 1.2%. The connecting rate remains stable at 23.8%. Passenger traffic at TAV Airports, 38%-owned by Groupe ADP, rose by +1.6% in November 2016, and has risen by 2.0%(1) since the beginning of the year. Passenger traffic at Santiago de Chile, 45%-owned by Groupe ADP, increased by 9.6% in November 2016, and has increased by 11% since the beginning of the year. (1) TAV Airports began operating the international terminal at Milas Bodrum Airport in October 2015. To be compliant with TAV Airports presentations, the % change presented above does not take into account traffic at this terminal for 2015. Taking into account traffic at the international terminal of Milas Bodrum, on a like-for-like basis for 2015, total TAV Airports passenger traffic would have risen by 0.3% since the beginning of the year, and by 0.9% over the last 12 months. 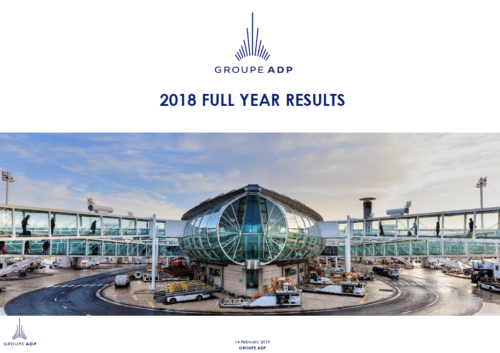 (2) Groupe ADP and TAV Airports have,a shareholding of 21% and 15%, respectively, in Zagreb Airport. To be compliant with TAV Airports presentations, Zagreb Airport traffic figures are integrated into the TAV Airports group traffic figures. (1) TAV Airports began operating the international terminal at Milas Bodrum Airport in October 2015. To be compliant with the TAV Airports presentations, the % change presented above does not take into account aircraft movements at this terminal for 2015. Taking into account aircraft movements at the international terminal of Milas Bodrum on a like-for-like basis for 2015, the total number of TAV Airports aircraft movements would have risen by 2.5% since the beginning of the year 2016, and by 2.8% over the last 12 months.